Ariba Med Spa Is Centrally Located to All Major Cities in the Silicon Valley & Is the Best Place to Get Your Botox! The Medical Staff Are Experts in Administering Botox Injections & Look Forward to Helping You Look as Young as You Feel. Get Rid of Frown Lines and Wrinkles Today. We are Conveniently Located at 37553 Fremont Blvd, Fremont, CA 94536. For millions of Americans every year, Botox is the answer to their aging concerns. At Ariba Medical Spa, we are proud to offer exceptional Botox injections for clients seeking to reverse the strain time has placed on their skin. Whether you are a seasoned Botox user returning for a touch-up, or you are new to the facial rejuvenation game, allow the experienced and compassionate providers at Ariba Medical Spa to help you unlock a more youthful appearance with Botox. No matter what your aesthetic goals are, our dedicated staff can help you love your reflection more than ever before. If you think that Botox may be the treatment option you have been looking for, it is important to know a bit about how it works. Botox injections use a purified form of the botulinum toxin to temporarily paralyze facial muscles. This temporary paralysis helps to reduce the appearance of deep wrinkles and lines around the eyes and mouth as well as on the forehead. However, because the paralysis of these muscles is only temporary, it is necessary to repeat your Botox treatments every 3-5 months in order to maintain the beautiful results. Because of this, it is especially important to find a Botox provider that you will enjoy returning to again and again. At Ariba Medical Spa, we pride ourselves on offering the very best Botox service available in and around Fremont, CA. Our office is warm and inviting, so you will look forward to return visits. Botox treatment sessions are generally simple and quick. Most treatments take only 15-20 minutes to complete, and the majority of people return to all their normal activities following their appointment. If you are interested in rejuvenating your facial appearance without invasive surgical procedures or lengthy recovery times, Botox injections may be right for you. At Ariba Medical Spa, our experienced staff has performed many Botox procedures, so they understand how it works and can provide you with a treatment protocol that will help you unveil a smoother and more youthful appearance. If you have found yourself fretting over crow’s feet or frown lines, let our dedicated med spa staff help you regain your confidence by revealing a younger-looking face. Your provider will work with you to create a Botox treatment plan that is tailored to your specific needs, ensuring you see the exact results you want. At Ariba Medical Spa, we are dedicated to helping our clients find customized solutions for all of their aesthetic concerns. We are proud to offer exceptional Botox service to people in and near Fremont, CA in an office that is designed to be warm and comforting. If you are looking for a med spa that can address all of your needs, then you have found the place you need to be. We believe it is our duty to provide the very best aesthetic service available in a space where our clients feel totally pampered. We offer appointments Monday – Thursday, so call us today to schedule your Botox procedure and take the first step toward a more radiant appearance. 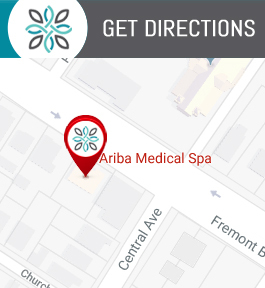 Ariba Medical Spa treats patients from all around the Fremont, CA area. If you live in neighboring cities, some of which include San Jose, Union City, Newark, Palo Alto, Menlo Park, Milpitas and Hayward – we are just a short drive away! Contact us today to make an appointment.